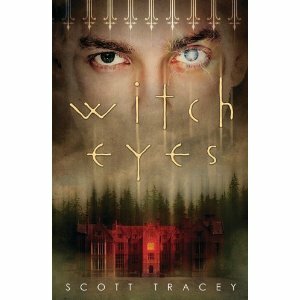 Scott Tracey’s debut YA novel WITCH EYES will be released by Flux in a few short weeks. His prior career highlights include: accidentally tripping a panic alarm and nearly being shot by the police, being attacked in a drive-thru window by a woman wielding a baked potato, and sending the health department after his (very brief) place of employment. I’ve always thought Scott’s blog had wise things to say about authors’ use of social media, and so I asked him to share a bit of his Twitter wisdom on Blurb is a Verb. Take it away, Scott! Writers are pushed, in this day and age, towards social media as a way to market ourselves. But there are so many ways to take it to the wrong place. Twitter's a perfect example. The way I see it, there are two main "roads" you can follow. Road #1) Twitter is a conversation. If I follow someone, it's because I'm interested in what they have to say. If I unfollow someone, that's because our talking points don't coincide anymore. People follow me because they're interested in what I'm saying, or because I keep them entertained. I build relationships with the people who follow me and talk to me, and having a good conversation is always the main goal. Road #2) The point of Twitter is to amass followers. The more tools I can use to amass as many followers as possible, the more I "win." I follow as many people as Twitter will allow me to, and unfollow them if they won't return the favor. Most people follow me because I followed them first. My goal with Twitter is numbers, not relationships. The more people I have following me, the more people who will hear my message. These are two vastly different approaches, coming at it from opposite directions. So which is more effective? As a writer with novel coming out, how many of my followers will reasonably be interested enough to buy it? The ones who follow me because they're interested in what I have to say, or the ones who follow me because I'm following them? When I hold contests, or talk about my book, who is more likely to retweet what I have to say, and who has the audience I'm trying to reach. The thousand people who follow because they're interested, or the ten thousand who couldn't pick me out of a lineup? Who are more likely to promote my book on their own time - whether tweeting about it, blogging about it, posting a review or holding a contest? The point of Twitter, at least in my experience, is having the right kind of followers. Followers who get invested in YOU, not in being one of your numbers. Don't Be Annoying. Seriously. Yes, you have a book coming out, but that should never take over your Twitter stream (except for possibly the few days surrounding your release). Make an effort to keep the self-promotion down to a palatable number. A random polling of people on Twitter suggested that over promotion is the MAIN reason why people stop following authors. If all you're talking about is your novel, people are going to tune out. Don't spam people, whether it's about your latest blog post, every review you've ever gotten, or notifications from Tumblr or Formspring. Be interesting, not predictable. Communicate Better; Don't Just Shout Louder. If I have 10K followers, but all I tweet is about my book for 3 months before it comes out, how many of those 10K will stop following me, or wind up not buying my book out of spite? Chances are high on both counts. Promote other authors. Talk about your life. Make promoting yourself one of the smallest parts of what you do on Twitter. Being an active, interesting viewpoint is enough of a marketing plan. People will support you just because you're genuine. Never air your dirty laundry on Twitter. Never get into serious fights with people (opposing viewpoints is fine, but never devolve into name-calling). People don't forget. Seriously. At BEA a few weeks ago, a book blogger referenced a Twitter fight I remembered seeing. 2 years ago. Yeah, they still remembered, and so did I. And that's not the reputation you want to wind up with. Twitter is a terrible therapist - and the last thing you want is for people to think you're unbalanced. Keep the bad things to yourself. Some people may be supportive, but it's the ones who don't say anything at all that you have to watch out for. You may offend someone without even knowing it. Develop your own voice. There is only one Maureen Johnson. There is only one Kiersten White, or Sarah Rees Brennan or Rachel Hawkins. Yes, you could try to mimic their Twitter 'voice' in the hopes of replicating their success, but eventually people will tire of the shtick. Develop your own voice, it'll get your further than imitation ever will. Don't be an "upseller" author. There are some authors out there who are always on the lookout for the next "level" of success. They only talk to authors bigger than they are, only make the effort with people who can help them grow. They may acknowledge the occasional fan, but their eyes are on moving up in the world. Don't be one of those people. If someone talks to you, talk back. Try to get in the habit of responding to most, if not all, @replies. If you're trying to get more active in the Twitter community, then talk more. Make a goal of @replying 5-10 people every day. Start conversations. Ask other people questions. People will follow you if you're interesting to talk to, but that first step involves actually TALKING. Twitter is a place to start conversations. But unless those conversations have formed friendships that exist outside of Twitter, don't abuse your "Twitter friendship" by asking or expecting favors. No one owes you anything on Twitter. Like I said above, Twitter is a conversation. If our conversation isn't working, I don't owe you a follow. And vice versa. Don't take it to heart if someone doesn't follow you , or was following but then stopped. Focus more on the people who stick around. Twitter is a great place to network, build industry contacts, and promote yourself. But it's far, far too easy to abuse and to push people away instead of drawing them in. Keep that in mind the next time you're about to tweet. Excellent post!!! I have had to unfollow several authors lately for excessive self-promotion. One author, was especially obnoxious, tweeting about the release of her book every few minutes for weeks. I looked at her profile page & scrolled back thru the tweets. Not one non-promotional post! She even had her husband doing the same thing form his twitter account. (Who are we kidding? It was her tweeting in his name.) So, I unfollowed both of them. Then, unfortunately, she started spamming me with @ messages...about her stupid book! I finally had to call her out on it. I told her she would get more support if she actually talked to people. I don't think my advice was very well appreciated. Oh, well! Rachel -- me too! It's easy to err on the side of bashful. The balance is tough. This is perfect. I've unfollowed people for just this reason, a constant barrage of self-promotion. Another's on thin ice as we speak. I understand people being excited about their books, or good reviews, but a little self-restraint is called for. It's tiresome, I quit reading even before I unfollow so it doesn't really matter what they're saying once they've crossed the line. Being "real" on twitter is important but also to not be annoying regarding your personal life as well. How many tweets do you want to read that involve the person whining about something in their life? I start searching for the unfollow button when the author is negative about everything and has nothing exciting and upbeat to say. Scott is actually the one who pointed me in the direction of a Twitter-saving trick: filter out all the automatic tweets that come from Formspring, Tumblr, Goodreads, and FourSquare, depending on which you find annoying. It's all of the above for me since I prefer to use Twitter exclusively for tweeting. In TweetDeck,* go to Settings, then Global Filters. Enter the web address of the services you'd like to filter: formspring.me, tumblr.com, goodreads.com, foursquare.com, etc. It's honestly saved some people from being unfollowed because I like their general tweets but they're a bit too prolific with the other things, at least for my taste. Also, great points, Scott, on how to use Twitter effectively as a writer. *It only works on TweetDeck, but it's so worth switching to that Twitter app for this feature alone. I am so Twitter-phobic, and everyone keeps telling me I need to tweet. But I'm fearful of sounding like. . .a twit. I don't go along with the need for reciprocity. If I follow someone, it's because I have some interest. If they don't follow me, who cares? I delete obvious spammers but otherwise, I'm not on an ego trip. I'll usually follow someone back unless they start spamming. One never knows who might find an interest in something I've tweeted. However -- and this, for me, is the biggie -- I don't see a fraction of tweets, and I assume the same goes for everyone else. I use Tweetdeck and filter those I really "care" about into lists, but there's no way I see more than a handful of tweets from the 1700 or so people following me. Where oh where were you with this wisdom before now?? I've been trying to achieve this balance, while also feeling like Twitter is the downfall of our society (good only for fomenting revolutions to create new societies? ), with everyone referencing everyone else, sending people off on work-avoiding links. I find your post useful and comforting. I'm also just learning that one way to combine the numbers/conversation/purchase-the-book elements is to use hashtags however you please. For instance, my daughter said something funny about the (e.g.) #royal wedding -- months after the fact, and while I was in the midst of trying to promote my book. But it got retweeted and got me followers and maybe got some people interested in reading my book because it was like a writing sample indicating my type of humor. Again, thank you SO much for this post. Very helpful and steadying.